Introducing RENFROE Mobile, the official E. A. Renfroe & Company app for Android and iPhone! 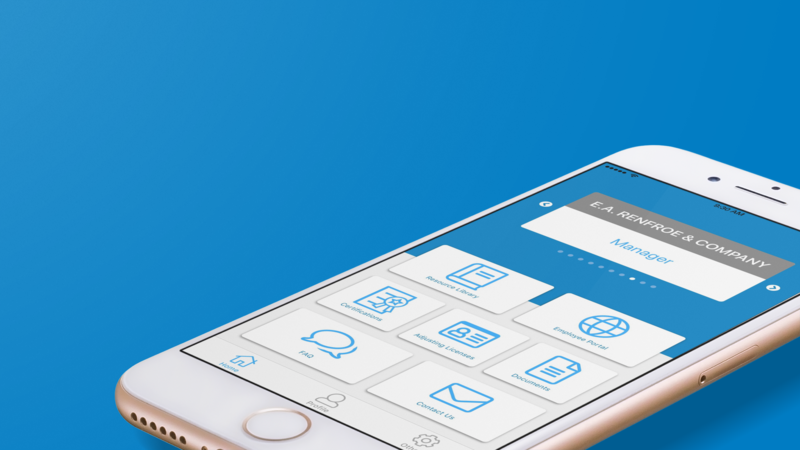 Designed specifically for our employees, RENFROE Mobile includes tons of helpful features that will help you stay connected and be more productive on the go. Download RENFROE Mobile for Android or iOS today. We hope you love it! Deployment Information - Receive project location, arrival date and time, client, position, and assigned manager(s) as soon as a deployment is accepted. Track Employee’s Licenses – Project managers can easily check on an employee’s license status, contact information, and more to keep your job running smooth. Easy Uploads – Uploading documents is now as easy as 1-2-3. Easily upload licenses, certifications, and other important documents with your iPhone’s camera. Simply choose your document type, take a photo, and upload! Quick Answers - View frequently asked questions for answers to our most common inquiries. Don’t see what you’re looking for? Contact the Home Office directly from the app with the tap of your finger.